I SEE IT. DO U? @boxlergo u do see what? I have a small recent version of EDs ABIEH. The one in the picture looks like it is bigger and could be about the same size as Eds other book Magnetic Current. This version is closest to the original. One thing that keeps racking my brain is the statistics page. 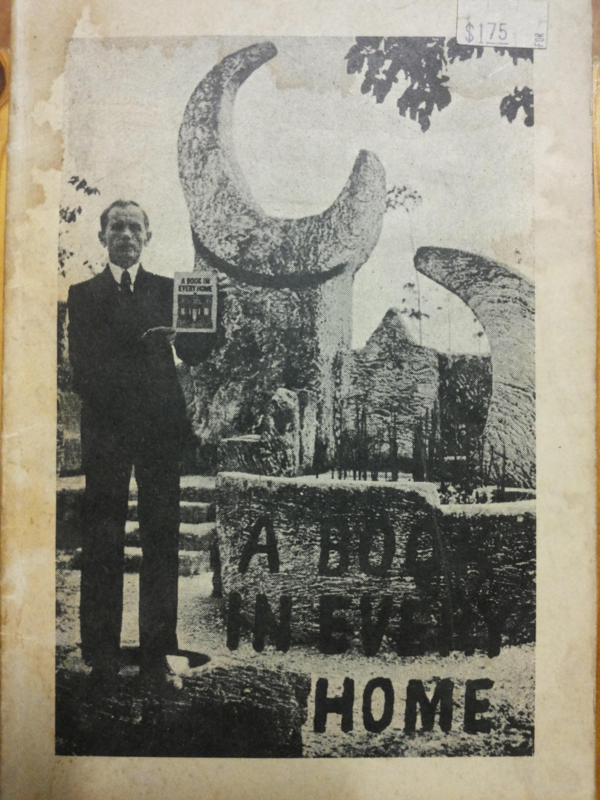 It mentions " Coral Castle " I have read somewhere Ed always referred to his place as Rock Gate, not Coral Castle. Do you also see the arrows?? One by the left shoe on the white place (black arrow), the second on the fountain (right side of the picture, just in the middle) ( white arrow with shadow in it)?? Its amazing what you can find from taking the visual hints Ed leaves. There is a reason he inverts photos. I dont know enough about his symbols, numbers etc. 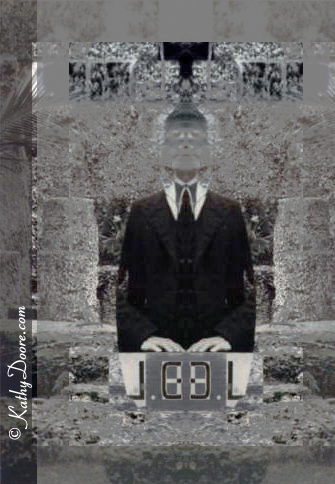 to know when I am locked on to the many possibilities when sliding on photo over another in photoshop using various blending modes. ABIEH yields 10 to 20 significant "lock" when moving one across another. Does 450 or 450 MI or CDL (roman numeral for 450) or LOC mean anything? (Do Re "Mi") Mi Moon? or Lighthouse? 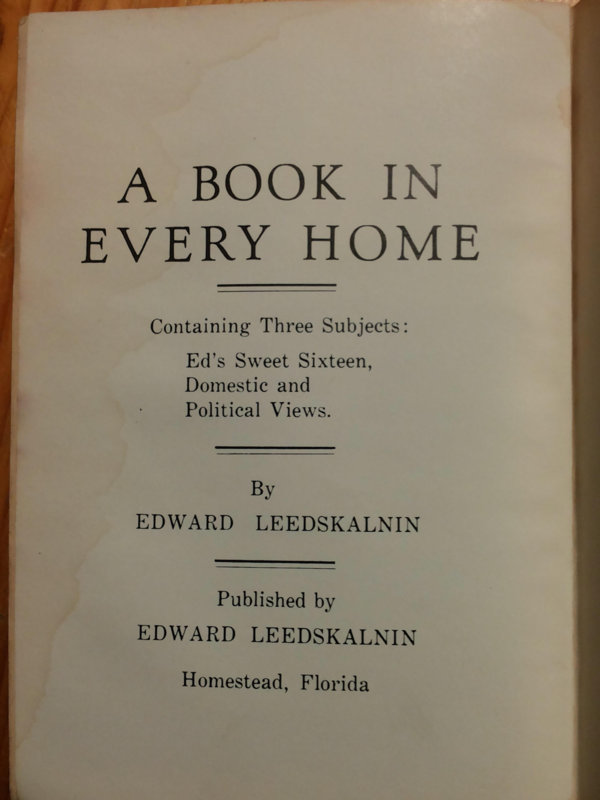 I see a photo of Edward Leedskalnin holding a copy of the book, "A Book In Every Home" with completely different cover art than the one featured here. This tells me that, at the very least, the version featured here is not the original version. The version which Leedskalnin is holding up for the world to see, is the one I want to get my hands on. Everything is in front of you. I feel Ed wants us to change our perspective. When we look at a building for a few minutes, walk away, and then asked if we can draw that building in detail without going back to take a look, would it be possible? We can only confirm what we see after being told what it is. Our brains quickly answer the questions our eyes ask, too fast in my opinion, we can miss out on soo much! The voynich manuscript has a few styles similar to Eds...depending how close or far you look. 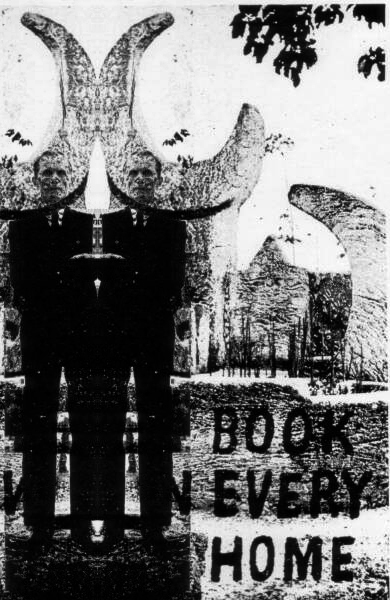 If you try to scan Eds works with a modern scanner, soo much will be lost. You will be seeing unusual accomplishment. So don't expect to see everything as easy as we have been taught through repetition. @dante ---there is a face ---side way-- next to the book , under the crescent , just have to look trough your eye lashes. How do you feel about how the title is lined up? Hebrew? @dante --- I've got more ,but not digging out my stuff. 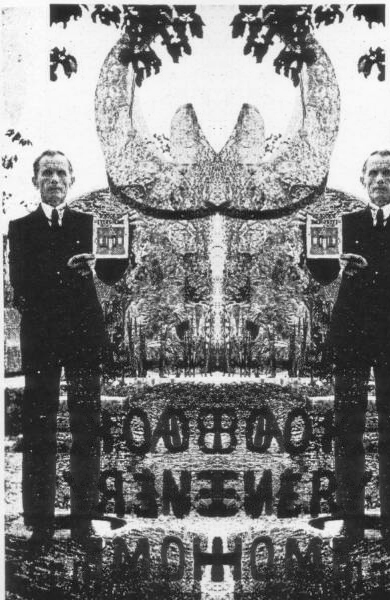 Have you ever read the sacred mushroom by John Allegro?